Argentina is the second largest country in Latin America. In 2016, one third of the population was living in poverty, according to officially published Government data. Rodrigo was forced to go to work at the age of 14 in a textile factory to help the family survive. 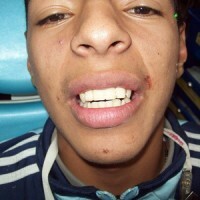 When he first arrived in Sonrisa III he was in extreme pain due the extent of infection and decay in his mouth. Most of his teeth were mere blackened stubs. He admitted to have never brushed them because “ he did not know what brushing would do to change his situation”. A total of 14 of his 32 teeth could not be saved. His constant smile of relief when he is with us says more than a million thank yous. A donation of £40 pays for a dental treatment for a child.